Believe it or not...One oil field accounts for 6.25% of the world's daily global production — about 5 million barrels a day. And unfortunately for the world, few people know the lies, scandals, and realities surrounding Ghawar, the world's largest oil field. Nearly 125 miles east of Riyadh, in the kingdom of Saudi Arabia, exists the most expensive and exclusive real estate on the planet. How pricy is land here? Yet this 1.3 million acre stretch of real estate contains no Hollywood-style, gazillion dollar mansions...There are no private beaches or hoity-toity, aristocratic shopping...There are no elite golf courses or exclusive vacation resorts. No...There's almost nothing at all. Just a big, dead, empty desert. Yet this virtually-uninhabited stretch of desert has made literal tycoons out of once nomadic tribesmen in just over 50 years. Actually, it was quite easy. You see, lying deep beneath this scorching, desolate landscape sits the largest and most important oil field in the world: The Ghawar Oil Field. 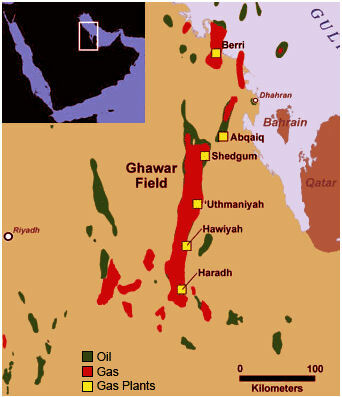 Ghawar is so large that its production accounts for about 60% of all Saudi Arabian oil. So there's no wonder why among the many prolific oil fields in the Middle East, the giant Ghawar field stands out as the region's crown jewel. The massive field was discovered in 1948. Production at Ghawar began two years later and reached a peak of 5.7 million barrels per day in 1981. This is the highest sustained oil production rate ever achieved by any single oil field in history. "Ghawar is the greatest oil-bearing structure the world has ever known. Its superlative qualities cannot be overstated. It is unlikely that any new oilfield will ever rival the bounteous production Ghawar has delivered to Saudi Arabia and the international petroleum markets"
During the mid and late ‘80s, Ghawar's production rate fell as it was restricted for market reasons. But by 1996, with the development of two other areas in the southern area of the field, production went back up above 5 million per day. Since its discovery Ghawar has produced more than 55,000 million barrels of the black goopy stuff. And there's still more oil to be found deep under the earth. However, no one is sure exactly how much more crude the Ghawar oil field still contains. Like we talked about in last week's article, The Great Oil Reserve Swindle, there's a lot of evidence that suggests official oil reserve numbers, put out by the Saudi Arabian government, have been fudged on purpose. So, it's quite likely that there's not as much oil at Ghawar as the Saudis say. In fact, there's probably a lot less. And for the oil starved economies of the world...that's bad. In Saudi Arabia, seawater is injected into oil fields to increase pressure and thereby stimulate production. Now, normally only 30% of the oil in a reservoir can be extracted. But water injection increases that percentage — known as the recovery factor — and maintains the production rate of a reservoir over a longer period of time. However, over time, the volume of water that is lifted along with the oil increases, thus the volume of oil declines proportionally until eventually what flows out of the reservoir is almost pure water, and the field is no longer worth operating. Saudi Aramco, the national oil company of Saudi Arabia and Ghawar's operator, is currently injecting a staggering 7 million barrels of sea water per day back into Ghawar in order to prop up pressure. And at the Offshore Technology Conference a few months ago, experts were claiming that Ghawar was producing about 55% water. That means that more than half the fluid brought up the well is water! "Ghawar will not run dry overnight, but the beginning of the end of its oil is in sight." For now Ghawar is still far too productive to abandon. But because of increasing problems with managing the water Ghawar is becoming very costly to maintain. And one day in the very near future it will become uneconomical to extract Ghawar's oil and the field will be discarded. The "official" reserve estimate at Ghawar is about 70 billion barrels — about 12% of the world's total. But like we talked about last week, who's to say how much oil is really still there. But the heck with it. Let's give the Saudis the benefit of the doubt. And let's assume that there really is 70 billion barrels of crude in the ground at Ghawar. Shoot...let's even assume they'll be able to get every last drop of crude out of the ground. So we have 70 billion barrels of oil, right? According to the Energy Information Administration, the world consumed 85.29 million barrels of crude per day in the first quarter of 2006. That hypothetical 70 billion barrels at Ghawar would only last the world 821 days! You read that right — The largest oil field in the world only has enough oil to last the world just over two years. And that figure hasn't even taken into account the ever increasing worldwide demand. Granted, Ghawar isn't the only oil producing field around. Still, Ghawar is the undisputed heavyweight king of kings when it comes to oil fields. And like they say, if the head dies, the body is soon to follow. Today, the giant field produces about 5 million barrels per day — about 6.25% of the world's total oil production. Ghawar is, therefore, extremely important to the world's economy and well being. And unfortunately for the world, few know the actual state of Ghawar. Fact is...Ghawar's production rate is in decline. In April 2006, a Saudi Aramco spokesman admitted that its mature fields are now declining at a rate of 8% per year, implying that Ghawar may have peaked. You read that right...It's likely that Ghawar has peaked! And if Ghawar has peaked, Saudi Arabia has peaked. And if Saudi Arabia has peaked, the world has peaked! In fact, three of the four fields that I mentioned a second ago are in confirmed decline! "The big risk in Saudi Arabia is that Ghawar's rate of decline increases to an alarming point. That will set bells ringing all over the oil world because Ghawar underpins Saudi output and Saudi undergirds worldwide production." - Ali Morteza Samsam Bakhtiari, a senior official with the National Iranian Oil Company. Saudi Aramco has reportedly estimated that total production capacity from all its fields in 2011 will be 10.15 million barrels a day. That's about the same as its current capacity. But to meet expected world demand, the United States Department of Energy's research arm says Saudi Arabia will need to produce 13.6 million barrels a day by 2010 and 19.5 million barrels a day by 2020. Saudi Arabia has been the world's leading oil exporter for over three decades. Today, the country produces about 8 million barrels a day — roughly one-tenth of the world's needs. If Saudi production falls short, the consequences would be significant. And Ghawar's decline is the first sign of this decline. "In the past, the world has counted on Saudi Arabia. Now I don't see how long it can be maintained"
While the world has other large producers like Russia and Iraq, these countries do not have the massive reserves or excess oil capacity to export found in Saudi Arabia. Therefore they will not be able to make up for a short supply. And the new oil fields found elsewhere around the globe are tiny when compared to Ghawar and therefore will not be able to deliver enough oil to make up the difference. As a result, supplies will tighten and oil prices will increase further. The global economy will soon begin to feel the squeeze. Previous spikes in oil prices have helped cause recessions. But this time I'm afraid that the affects are going to be much worse. When supply finally eclipses demand, which will happen when ordinary consumers can no longer afford energy costs, then we'll see a reversal, says Energy and Capital editor Ian Cooper. Kids these days... They're terrible, right? The worst generation ever? Or could that kind of thinking be a bias that's holding you back from investment success? 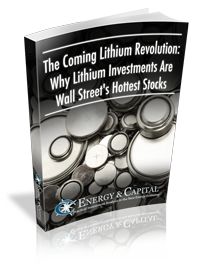 Energy and Capital editor Christian DeHaemer tells you why now is the right time to buy stupid stocks and how to do it effectively as we approach the blow-off top.